Court ruling says that Iranian companies that own 650 Fifth Avenue in Manhattan must forfeit the building to the victims of terrorism. Attorney Nitsana Darshan-Leitner, head of the Shurat HaDin-Israel Law Center, expressed satisfaction on Friday over a New York court ruling which allowed the U.S. administration to seize ownership of a Manhattan building linked to Iran. 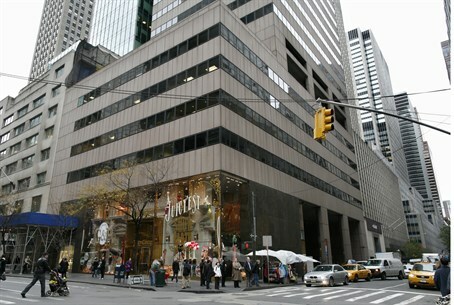 The ruling, handed down last week, said that the Iranian companies that own 650 Fifth Avenue in Manhattan must forfeit the building to the victims of terrorism, according to the New York Daily News. The skyscraper, worth some $500 million, was majority-owned by the Alavi Foundation, a non-profit organization that promotes Islamic culture and the Persian language. The 36-story, 382,500 square-foot building stands at the corner of Fifth Avenue and West 52nd Street, near the Rockefeller Center and Saint Patrick's Cathedral, reported the Israel Hayom daily. In a 2009 lawsuit, the Manhattan U.S. attorney's office claimed the Alavi Foundation was controlled by Iran. It also said two minority owners, Assa Corp. and Assa Co. Ltd., were shell companies backed by Iran's Bank Melli. Among the plaintiffs are five Israeli families who were victims of a double suicide attack in Jerusalem in 1997. The families, all U.S. passport holders, sued the Iranian government with Darshan-Leitner’s help. In 2002, a U.S. federal court awarded them compensation of $272 million. Under last week's settlement, however, the families will have to share the proceeds from the sale of the building with hundreds of American terror victims, including victims of the September 11, 2001 attacks, according to Israel Hayom. Last year, U.S. District Judge Katherine Forrest in the Manhattan Federal Court ruled that the owners were deliberately "shielding and concealing Iranian assets," in violation of U.S. law, and that the skyscraper was subject to government forfeiture. In March, Forrest ruled that a group of private plaintiffs, who won court judgments that they were victims of or affected by attacks aided by Iran and who had filed claims against the building, were entitled to take control of the skyscraper and other properties owned by the defendants. Plaintiffs include families of those killed in the 1983 bombing of the U.S. Marine barracks in Beirut that killed 241 military personnel. Darshan-Leitner said on Friday that the families of the victims of the 1997 Jerusalem bombing will receive a hefty sum from the proceeds of the sale, even with the share with other victims. "The building is valued at half a billion dollars. We did have the first right to it but many joined the lawsuit, and the U.S. government decided that the property will be divided among all the victims,” she said. According to Darshan-Leiter, despite the victory, there is still a long way to go until the victims and their families receive the compensation. "The Iranian organization that owns the building is will probably appeal the ruling and it could take another two years. But we believe that in the end we will win and Iran will pay,” she said.